PLASSMEX Blood Amino™ is a new generation amino acid preparation. Amino acids hydrolisate achieved from plasma globinof animal blood is an active matter. Plasma globin is the last amino acid raw material, next one after hydrolisates of milk proteins (whey). 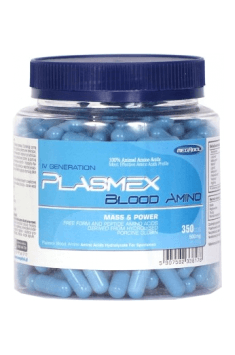 Plasmex Blood Amino 350 caps. Take 1-2 portion (1 serving = 10 capsules) per day, in the morning on an empty stomach and / or after training. Take 1-2 portion (1 serving = 10 capsules) per day, in the morning on an empty stomach, and / or between meals. You may assume that the daily amount of protein in the diet of athletes or physically active people should be from 1.5 to 2.2 g per 1 kg of body weight. If you do not cover your protein needs from the diet, you can take it in form of capsules. It is recommended especially for athletes who have a problem with building or maintaining muscle mas. It is worth to take one portion of the product in the morning after waking up and before going to bed. bovine plasma hydrolyzate, auxiliary substances: microcrystalline cellulose - filling substance, colloidal silicon dioxide, magnesium stearate - anti-caking agent, gelatin - capsule shell.